provides support for those grieving the loss of a loved one. The Bereavement Ministry provides a place where the bereaved have the opportunity to talk through their experiences, thoughts and feelings, with others who are also grieving the loss of a loved one. Doing so will help the bereaved in working through their grief on their journey to healing. A 10 - week Program uses the book "The New Day Journal - A Journey from Grief to Healing" written by Mauryeen O'Brien. The New Day Program helps the bereaved with the task of grieving. Sharing one's experience, feelings and pain is one step in becoming aware that you are not alone. A trained facilitator will conduct the Program, who has experienced grief in their life and are able to move with the group through grief and healing. 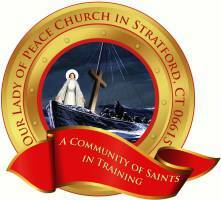 For more information please contact the Parish Office, 203-377-4863 ext. 10.